What it’s all about: Five Sentence Fiction is about packing a powerful punch in a tiny fist. Each week Lillie Mcferrin posts a one word inspiration, then anyone wishing to participate will write a five sentence story based on the prompt word. This week’s word: DIVERSIONS. None of the usual diversions worked, not the pink teddy-bear, the huge green bird or the purple octopus. The child rejected all her attempts to console and continued crying loudly and insistently for dad. When tiny hands pushed her away one more time, she could not hold back any longer. Already missing her husband and feeling lonely and helpless, she slumped on the couch and started sobbing. Suddenly she noticed the silence, and then a tiny palm was on her cheeks, gently wiping away her tears. Great take on the prompt, I’m sure there are quite a few mums out there that will recognise this! What a lovely, touching and well written story. Loved it! This is very sweet. I’ve tried Six-Sentence Sunday a few times, but not for a long time. 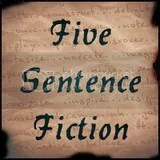 I like the idea of trying Five Sentence Fiction. I might try it! It’s such a sweet story.